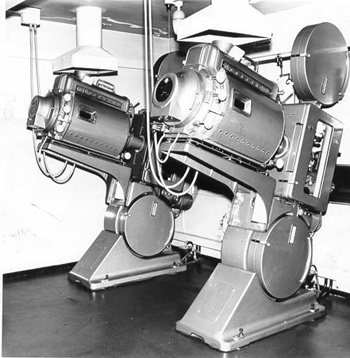 The birth of the DP70 projector dates back to October 1952 and the development of the Todd-AO process. Michael Todd, not satisfied with technical limitations of Cinerama, formed a company with the purpose to develop a new wide screen process which was named Todd-AO. For Todd-AO a new projector was required. 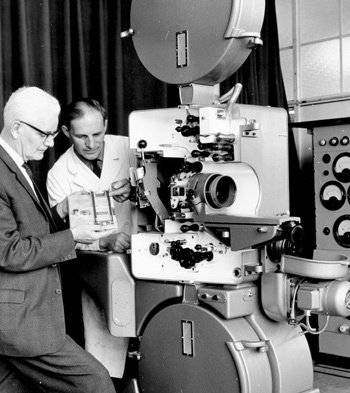 In September 1953 Magna Theatre Corporation approached Philips Cinema’s Chief Designer Mr. Jan Jacob Kotte in Eindhoven, Holland, who built the new multi purpose projector, suitable for all 70mm and 35mm formats, in only nine months. It was a revolutionary projector and so versatile it could show any film format except horizontal double frame VistaVision. Jan Kotte worked day and night with his colleagues and even went as far as installing a home-office with a large drawing board, which was unheard of in 1953. All projector mechanisms were made in Holland in a series of one hundred at a time. Other projector parts like spool boxes were also made in the United States by American Optical Company. In the fall of 1954, the first prototypes were sent to the US, and they were installed in Todd-AO’s test cinemas in Southbridge, Buffalo and in California. The first batch of machines, numbered 601 to 700, were sent to equip the first 40-50 cinemas for the North American premiere of “Oklahoma!” in October 1955. Some of the first machines were even marked "Property of the Michael Todd Company, Inc". United Artists, Detroit, USA, Martz 1956. Usually there were two machines in a projection room. A left and a right projector, but in some cases three and four machines were needed, like at the Rivoli, which had two projection rooms – upstairs and downstairs, each equipped with three machines. The DP70 was used for all Todd-AO presentations in the years to come, and by Oscar Night, in March 1963, there were 525 DP70 installations in 39 countries. Not only cinemas had the DP70. Studios like 20th Century-Fox, MGM, Warner Bros and Paramount Pictures in Hollywood had the DP70 in their main screening rooms. 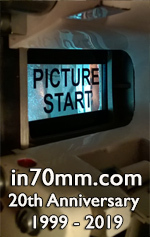 Film museums in Amsterdam, Oslo, Stockholm, Paris, Bradford, and Hollywood also have the DP70 installed for 70mm presentations. The DP70 was truly a remarkable 70mm projector, and on Monday April 8, 1963 Fred Pfeiff, technical manager of Norelco, received a Class 2 Oscar plaque on behalf of the Philips company. Philips originally named the new machine the EL4000/01 in their catalogue, but it quickly became the DP70. The "DP" is short for "Double Projector" and the "70" meant it was designed specifically as a 70mm projector. In the United States it simply became the "Todd-AO Projector, Catalogue # 3070". Later the name was changed to "Universal 70/35" and finally from 1963, it became the "Norelco AAII". "AA" was short for “Academy Award” and “II” meant “Version 2” because of the many new changes and improvements. 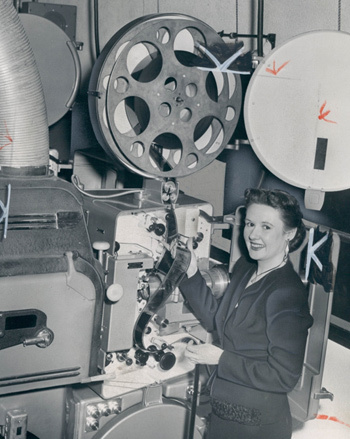 Jan Kotte nicknamed the projector the "Dollar Princess" because he knew Philips made a considerable amount of money developing it for Magna Theatre Corporation. All through the 1960s and until recently, the DP70 was faithfully projecting movies in many prestige cinemas all over the world. It is not known precisely how many machines were made, but Kinoton estimates at least 1500. When 70mm cinemas started to close, many machines were scrapped and sold as old iron, and there were even stories about some Australian machines ending their life as boat anchors in Sydney Harbour. Many machines were transferred to other cinemas and some even went to private collectors. Today, when most cinemas have converted to digital presentations, there is less need for the DP70 – or any other film projector – and most of the machines are now redundant, with notable exceptions such as the Schauburg, and other 70mm venues. The DP70 was the Rolls-Royce of 70mm projectors, an outstanding machine, easy to work with, gentle to film and a beautiful piece of 1950s art, and probably the most successful part of the Todd-AO process.